No the hajees have not returned, nor has the eagle landed! 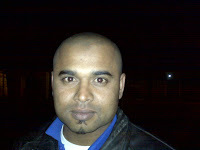 Our very own MCC Player of the year 2007/2008, NASIER CHARIWALA, has a new hairdo!! The paparazzi is out there trying to get a pic for us, and will be posted as soon as we have one available.For the time being, whoever sees our favourite india papa, lets bete him and tell him '' mubarak''!! Bo stylish bhai..but now you wont be wery afro-dynamic! !